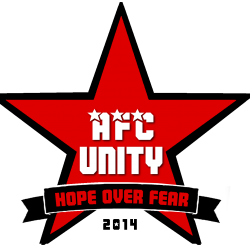 But for a brief moment – particularly at the beginning of our affiliated football journey – AFC Unity have never been at the bottom of the league. We’re there now. There will be some celebrations. 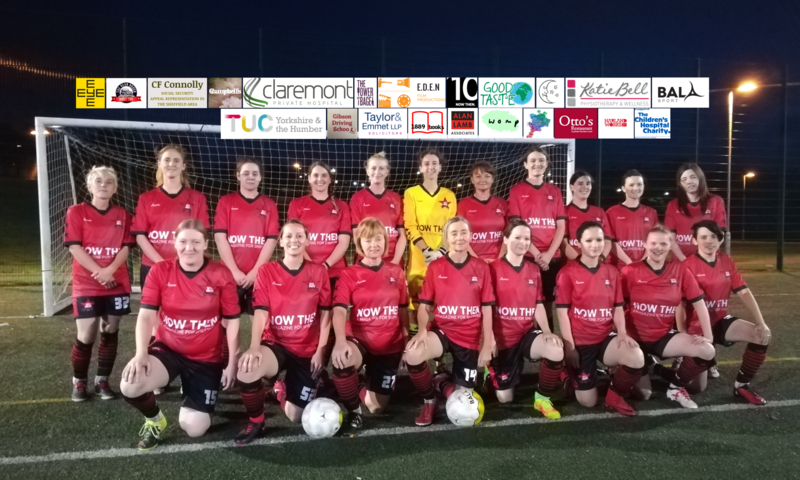 Those who opposed our ethos as a socially progressive, independent women’s football club – from our food bank actions to our trade union links to our entire football philosophy matching this as an approach committed to “Hope Over Fear” and “100% Positivity” (years before it was in vogue with the FA) – will bask in this moment. Oh, yes. Those overly perky, pesky, positive do-gooders are rock-bottom! Hallelujah! In seriousness: I recently attended an annual club meeting where I addressed what I felt was the backstory to this situation, but any football manager will always seek a vote of confidence and in doing so will often offer behind-the-scenes insight and rationale that can and will inevitably be interpreted as excuses. These can include the fact that the league has grown in quality while we have steadily recruited good people and then developed them into even better players; individualists who didn’t fit our spirit of collectivism left the team having previously portrayed themselves as being in for the long haul and this naturally disrupted the squad; and, we’ve had brilliant players enter the team from our award-winning Solidarity Soccer programme, but have needed time to gel. This is all in addition to the fact that I am stubborn in my refusal to sacrifice beautiful football for results, or build a team around any one player for short-term gains. Everything has been designed to have a long-term strategy. It’s why we’re one of about half a dozen teams still in existence from around twenty teams in the league when we joined (some championship-winning teams from that time have even been wiped from existence due to their boom-and-bust culture and reliance on results and individuals). So yes, of course there are logical reasons for this. I didn’t suddenly become worse at managing. The team certainly isn’t worse. This team I have now would beat any of our teams from the past; they’d rout them. There are lots of contributing factors for our current situation, and the above are just a few of them. Ultimately, people will think what they want. As I encouraged my players from the sideline at a recent game, praising them in staying positive, an opponent on the bench shouted over, ‘How the hell can you be positive when you’re losing?’ to which I said, under my breath while rolling my eyes, ‘You’re winning and you’re still not positive.’ It was true. Not all, but most of the teams who beat us look utterly miserable after the game, while we’re positive and see things in their correct context. I’ve said that in this column before. But why is this? Well, we’re almost more like a social movement with everything we do in and around the first team itself. We’ve always said, if as a team you’re only about winning on the field, well then when you lose you have nothing else left. We have plenty left. But it’s important to avoid existing inside that bubble, and instead be fully aware of how you’re perceived outside of that bubble. So let me humour that for a moment. I know we’re perceived as being the rightful occupiers of the bottom spot in our division. I know that. Teams interpret our unshakeable positivity, even in defeat, as a sign that we don’t take football very seriously and therefore don’t care about winning. That’s wrong, but I know that’s the perception. Officials also, I feel, are likely to buy into this narrative too, because for all the praise about AFC Unity for our conduct (as previous national Respect winners, no less), I truly believe they’re likely to allow that to influence their view of the game: if decisions don’t go Unity’s way, who cares because they’ll never complain, and they’ll expect to lose, anyway. We’re also perceived in a way where we couldn’t possibly be serious about football if we also have a relaxed, friendly, fun, and positive environment: usually you have one, but never the other. So, invariably, I personally will be perceived as some clueless football philistine punk rocker leading cheers from the sidelines (and admittedly I probably play on that if anything, as I love being underestimated). But it wasn’t always this way. In our first season, after recruiting whatever players we could get to take a chance on this unknown brand-new team, we gained several upset victories, attracting wrath and vitriol for daring to define ourselves as “underdogs” while winning games and gaining promotion from Division Three to Division Two. We knew this idea of a socially progressive, independent women’s football club would forever define us as “underdogs” by default, and we knew the journey would be this way: full of twists and turns, trials and tribulations, as we tried to do something very, very different. As part of that, we also knew that on-the-pitch determination and aggression from those individually skilled players – playing for the name on the back of their shirt rather than the one on the front – would eventually see most of these very players leave when the culture of collectivism over individualism kicked in and truly dawned on them. We have an amazing group of people playing for us now, new and old. These players openly embrace and enact and reinforce our culture and reject those of other football clubs. In turn, we’ve delegated more and more tasks to players so they have a sense of ownership over AFC Unity – and I’m sure we will be going even further in that direction in future. So what about this “bottom of the league” business, then? Who’s going to be the architect of “The Great Escape”? Obviously it has to be me – you don’t have rights without responsibilities as well (I’ve always believed that, in life, they must be irrevocably intertwined) – but I have to have consistency and commitment to carry from one season to another. Would I stay on as manager if I didn’t succeed in this epic challenge? I’ve said I’m open to any consequences. I’d stay on if the squad stayed on, and if that squad wanted me to. Towards the end of 2018, realising the squad available wouldn’t be the one I’d originally anticipated at the start of the season, I apologised to the team and took responsibility for some bad results, and switched the system of play. It did its job for a while – we stopped haemorrhaging goals, for one – but we still failed to make a big push of it. I’ve always liked positive, pro-active, attacking football – that’s actually been one of the biggest criticisms of me from ex-players, probably. Before the holiday break, I warned of the danger to come if we were to play for 1 point rather than 3, or play it safe rather than take risks. I perhaps didn’t always communicate that in the best way possible. But the fact is, we truly have nothing to lose now. Let others celebrate, let them laugh, let them point fingers, let them ridicule, and let them continue to underestimate me, and us, in Unity.